Network PromoterMidland Border East Training Ltd.
Midland Border East Skillnet is a regional, multi sector learning network for companies of all sizes in the Midland, Border and East regions. 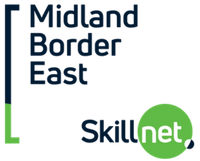 Midland Border East Skillnet is promoted by Midland Border East Training Ltd. Membership of the network is open to private enterprises based in the Midlands, North East, West and North West regions. We have always worked with Midland Border East Skillnet when it comes to training new staff members or upskilling our existing employees. Midland Border East Skillnet have worked closely with us in funding and developing our Irish Management Institute (IMI) accredited Management Development Programmes, at both Certificate and Diploma levels, and all participants benefit greatly from these training programmes. I have found the team at Midland Border East Skillnet to be both professional and efficient in all aspects of their work. They are ever supportive and empowering, allowing our organisation to excel at the things we do best, secure in the knowledge we have their support and guidance every step of the way. Working with Midland Border East Skillnet has allowed our business to streamline our training and upskilling needs to one single entity. This improved efficiencies across our business units, allowing us to gain maximum capacity and funding towards our training and upskilling needs.